Want to eat well? Eating sustainable food is half the battle. Want to eat well and ethically? Zev Robinson's films look at some of the issues surrounding sustainable food in Scotland. 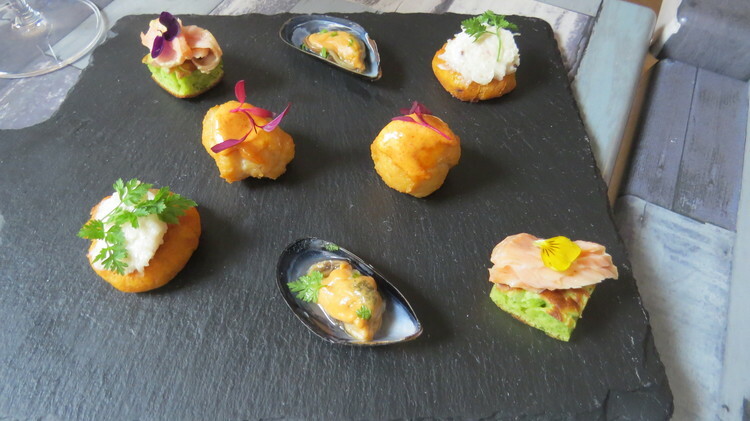 Last Sunday, the 5pm Food blog was invited to the Kilted Lobster restaurant in Edinburgh's Stockbridge. The idea was to try our hand at prepping some Scottish seafood and watching a couple of documentaries by the British-Canadian artist and film maker Zev Robinson. In between the films, we chatted and ate a succession of seafood dishes prepared by The Kilted Lobster's chef patron Colin Hinds. Zev's documentaries have covered subjects as diverse as the Spanish wine industry and British chilli farming. At this event, we watched his films The Black Isle and The Fish in the Sea. Respectively, they looked at crofting on the Black Isle and Scottish day boat fishing. You can see trailers for them here. What links all of Zev Robinson's films is that he is interested in the back story of the food we eat. Not just where it comes from and how it is produced but how history influences our diet. 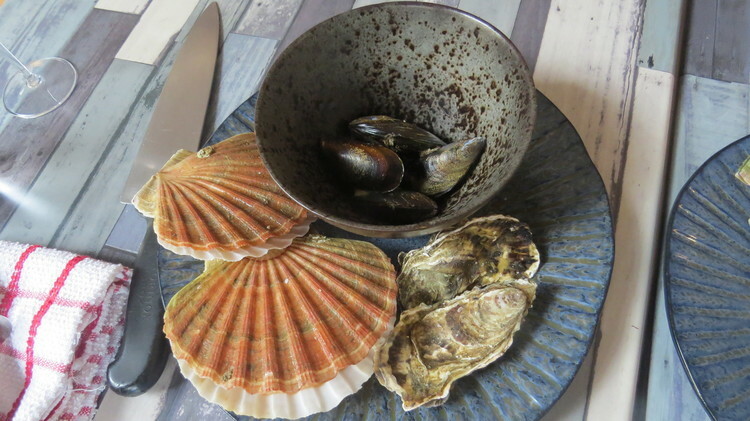 Orcadian scallops, Shetland mussels and Cumbrae oysters. Watching the two documentaries, this blogger was struck by the similarities between crofting and day boat fishing. Both are small scale, low intensity endeavours that tend to be carried out by the self-employed or small, often family-run, businesses. I am generalising here but both are geared towards feeding the local community or being part of a supply chain which is a lot shorter and a lot more transparent than that used by supermarkets. Rather than being at sea for two weeks and fishing for 24 hours a day, day boats, as the name suggests, go out for the day and then return to port with their catch. The fishermen often use creels or lines to catch fish and crustaceans. Some hand dive scallops. Compared to deep sea trawling or dredging, these are methods which produce fresher food and a lot less waste in the form of discards. 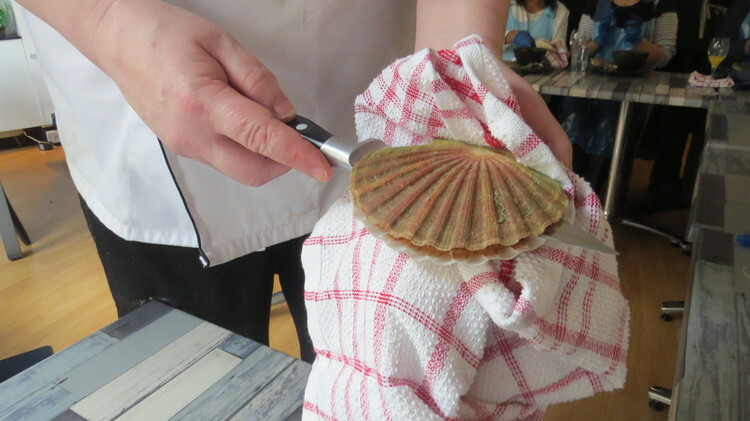 If the fish is fresher or the scallops are hand-dived rather than dredged - a process which can produce broken shells and sandy meat - then the consumer gets a better product. Not to mention one which is considerably kinder to the marine environment than more industrial methods. Scottish seafood at the Kilted Lobster. There are parallels with crofting. Especially in terms of meat production. In general, crofters tend to rear beasts which mature more slowly than those reared using intensive methods. Their animals have more freedom to roam around and this exercise produces meat with better marbling. If you wanted to look at the environmental benefits of meat reared on a croft then crofters don't routinely use antibiotics. Cutting back on their in the food chain is one way of reducing the possibility of a pandemic which cannot be treated by existing antibiotics. Compared to most of the meat you will likely find in your supermarket, that produced by small crofts will be of better quality and the animals will have had a better quality of life. All this is before we look at the benefits of sustaining rural communities which are sometimes in remote locations. Obviously, we are not all going to become crofters or day boat fishermen. Nor do crofts or day boats produce enough food to begin to replace the sheer volume of food bought from supermarkets. Sustainable food production is a big, complex issue. And the problems inherent in existing food chains are not going to be solved over lunch. However, what Zev's films do is to provoke thoughts about food production. His argument is that all big changes are the result of lots of small steps. If you are interested in what we eat then keep an eye out for Zev Robinson's documentaries. News of forthcoming screenings will appear here. As we regularly state, we don't do reviews on the 5pm Food blog. That said, we want to give a big shout out for Chef Hind's Alba skink. 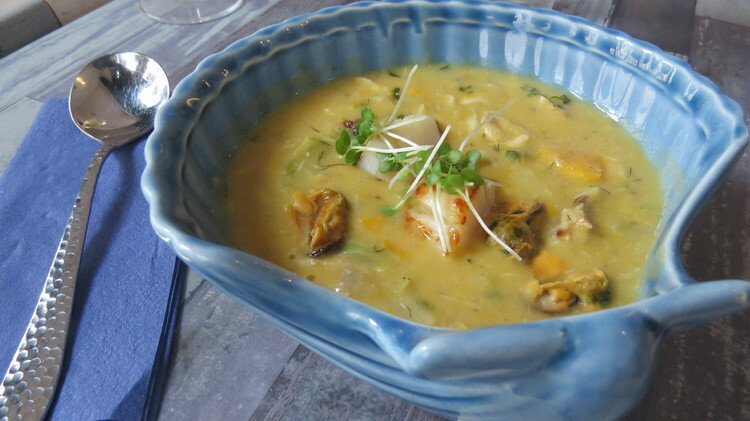 Rich, creamy and packed with a variety of Scottish seafood, including meaty scallops, it is the superhero equivalent of a Cullen skink. Colin let on that he has a couple of projects up the sleeves of his chef's whites. 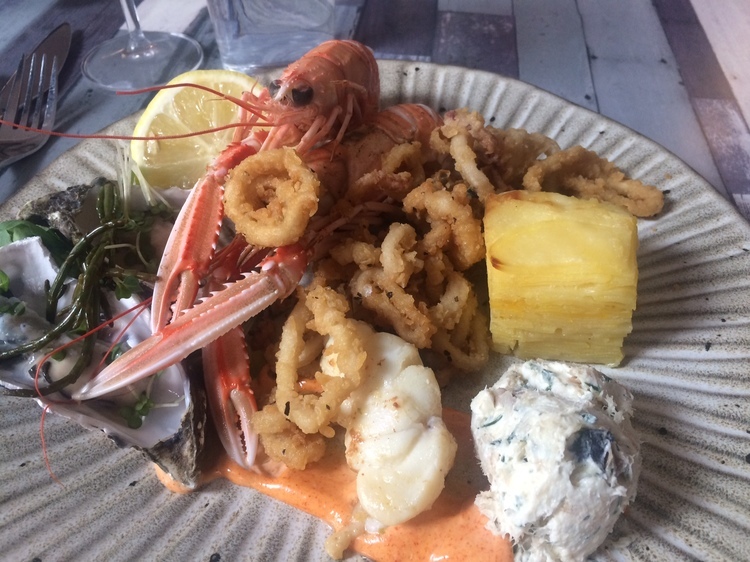 Is there a better way to get Scottish seafood on the plates of Scottish restaurants? Watch this space. Chef Hind's Alba skink: as chunky as it is creamy. Chef Hinds gets in on the scallop action.